Moodle courses should be purged periodically to maintain a clean environment for you and your students. This housekeeping is nonessential; many (if not all) of you have never bothered with it before, and things have gotten along fine. However, this cleanup is very helpful in keeping your course rosters accurate and uncluttered, as well as keeping students' Moodle accounts up-to-date (as old courses will show up in their home screens if they are still enrolled in them). Please follow the following steps to remove out-of-date students from your class rosters. Log into Moodle using your LDAP username and password. Method 1: Reset Entire Roster. Note: this method removes all students currently enrolled in a course, whether they are current students or leftovers from previous semester. In the Administration menu, click Reset. 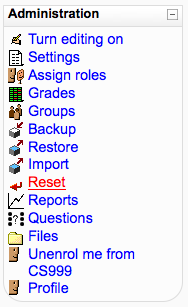 From the Reset course screen, in the Roles section, select Students from the "Unenrol users" selection field. There is no need to uncheck the "Delete all local role assignments". Click Reset course. You'll be directed to a Reset course confirmation screen. Click Continue. Method 2: Removing Individual Students. In the Administration menu, click Assign roles. 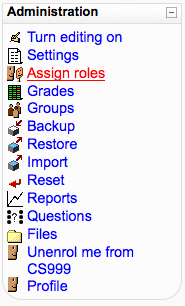 On the Assign roles screen, click "Student"
From the Assign roles in Course: page, highlight the student(s) you wish to remove from the roster and click Remove. Once all non-current students have been removed from the "existing users" list, click Assign roles in Course: XXXXX (where XXXXX is the name/number of your course). Once you've completed these steps, your rosters should be updated to match the current enrollment of your courses. One nice feature of these methods is that they leave all historical data intact, so you can still see how former students performed on any assignments you used in the past, etc. If you'd like to get rid of that information check the appropriate boxes in the Reset course screen in step 2b before clicking Reset course.